Simone had her four month check up this week. 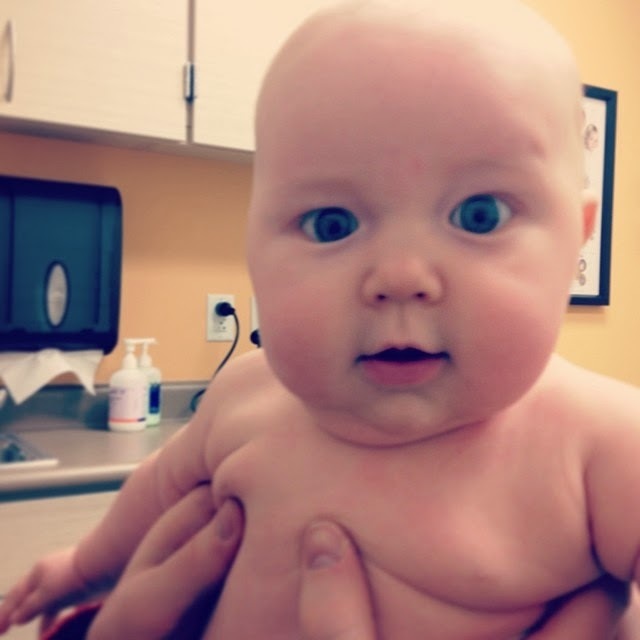 Our sweet little butterball is in the 96 percentile. I desperately want some high waisted skinnies. These flats are at the top of my must have fro spring list. I think the juxtaposition of this print and fabric is fabulous. I can't wait to try this pretty braided hair style. This heart shoe DIY is so clever. Did you see this week's 10 Fab Finds? I am hoping to get a few sewing projects (to post!) done this weekend. What are you weekend plans? She is as cute as can be! The Anthro top is now cheaper- $30. Can't wait to see what you've sewn! My 2 yr old loves to mess around with my sewing machine so I can't ever get it out for very long. Hopefully I'll get to soon, though!